What is usually described as a poster (below) for the Stable Gallery show included a photograph of Andy Warhol and text by the art writer Gene Swenson. Swenson was considered a genius by some, a madman by others - or both by some people in the art world. A perusal of the poster leads to an examination of Swenson's life in general and some of the people who were involved with him besides Warhol - namely the critic, dancer and Warhol star, Jill Johnston, the artist Ann Wilson, and Ann Wilson's husband the art writer and collector, William S. Wilson (aka "Bill"). Ann left Bill for Gene after, in the words of Jill Johnston, Ann had "fallen in love" with Gene, leaving Bill to raise his and Ann's three children on his own. Bill and Gene had something else in common besides Ann. They were both homosexual during an era in which homosexuality was either suppressed or kept secret. Gene and Ann also had something in common. They had both been, according to Jill Johnston, patients at Bellevue Mental Hospital, although presumably not at the same time. 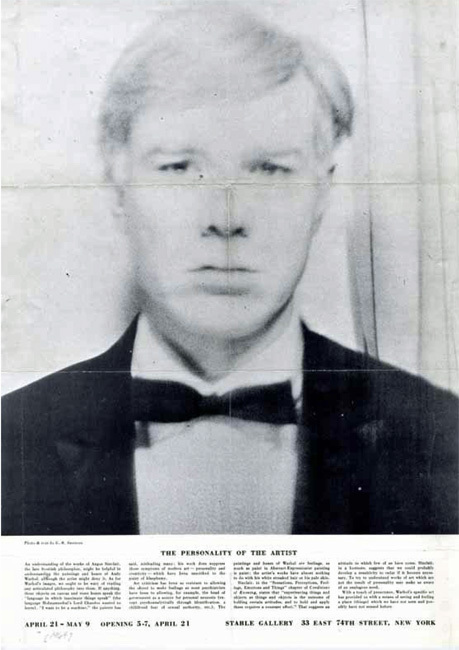 According to Bill Wilson, the "Personality of the Artist" poster was used (or at least planned to be used) to advertise a lecture that Gene Swenson had prepared about Andy Warhol. He mentioned the poster and the talk in an email he sent me last year. He had received some papers which he originallly thought were by Gene, but after receiving them, thought they might be notes by his wife of interviews she had done with people in Pittsburgh, presumably to support Swenson's research into Warhol. I now have, from 1964, several typed pages which record conversations (interviews) with people in Pittsburgh who were acquainted with Andy as family, friends and teachers. I also have Gene Swenson’s manuscript for a lecture, a "conversation" about Andy Warhol, “The Personality of the Artist,” and the poster for his talk, largely a bleak photograph of Andy. An understanding of the works of [William] Angus Sinclair, the late Scottish philosopher, might be helpful in understanding the paintings and boxes of Andy Warhol, although the artist might deny it. As for Warhol’s images, we ought to be wary of reading any articulated philosophy into them. If anything, these objects on canvas and store boxes speak the “language in which inanimate things speak” (the language [Hugo von] Hofmannsthal’s Lord Chandos wanted to learn). “I want to be a machine,” the painter has said, misleading many; his work does suppress those symptoms of modern art - personality and creativity - which have been sanctified to the point of blasphemy. Art criticism has been as resistant to allowing the object to make feelings as most psychiatrists have been to allowing, for example, the head of government as a source for personal neurosis (except psychoanalytically through identification, a childhood of sexual authority, etc.). The paintings and boxes are feelings, as much as paint in Abstract-Expressionist painting is paint; the artist’s works have almost nothing to do with his white streaked hair or his pale skin. Sinclair in the “Sensations, Perceptions, Feelings, Emotions, and Things” chapter of Conditions of Knowing, states that “experiencing things and subjects as things and objects is the outcome of holding certain attitudes, and to hold and apply these requires a constant effort.” That suggests an attitude to which few of us have come. Sinclair, in a footnote suggests, that we could probably develop a sensitivity to radar if it became necessary. To try to understand works of art which are not the result of personality may make us aware of an analogous need. With a touch of prescience, Warhol’s specific art has provided us with a means of seeing and feeling a place (things) which we have not seen and possibly have not sensed before. Swenson was the person who interviewed Warhol for Art News in which Warhol is quoted as saying he wants to be a machine. So it's interesting that here Swenson seems to discount that theory - that although Warhol may have said he wanted to be a machine, the artist's portrayal of objects (and the box sculptures) produce "feelings." They produce feelings "as much as paint in Abstract-Expressionist painting is paint." Warhol's paintings and sculptures of objects provide "us with a means of seeing and feeling a place (things) which we have not seen and possibly have not sensed before." Unlike much of the print that came out about Warhol at the time, which focused on his image, Swenson notes that his works have "almost nothing" to do with his image - "almost nothing to do with his white streaked hair or his pale skin." Warhol was more than a media personality. He was an artist and his art must be considered as serious art - as legitimate as the art of the Abstract Expressionists. Warhol biographer David Bourdon has pointed out that there are some problems with the original interview of Warhol by Swenson in which Warhol is quoted as wanting to be a machine. Those problems were confirmed by William S. Wilson (Bill) who knew both Swenson and Swenson's editor Thomas Hess. According to Bill, Hess had edited Swenson's article.